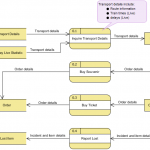 The DFD example here shows a context Data Flow Diagram drawn for a vehicle maintenance depot system. 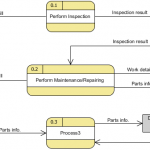 It contains a process (shape) that represents the system to model, in this case, the "vehicle maintenance depot system". 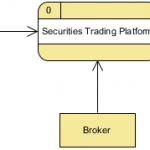 It also shows the participants who will interact with the system, called the external entities. 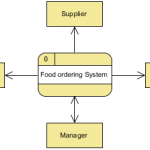 In this example, Customer and Mechanics are the entities who will interact with the system. 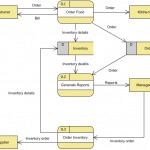 In between the process and the external entities there are data flow (connectors) that indicate the existence of information exchange between the entities and the system.